Ark was returning from the days patrol, he was keen to get back to his hatchlings since he had never been the same since Trinyah. Ark had his own nest with his hatchlings within the safety of the summer palace, As he was returning he spotted the hatchlings playing around the room. "Hey I'm back guys" he greeted them smiling. The hatchlings had grown quite a lot these past months most of them where around 3 ft and have learnt how to speak. "Daddy daddy daddy!" shouted Rayla, who had been wrestling her brother Thirahan - and had been winning - when she had spotted her father coming through the room. Her odd shark-like tail wiggled back and forth in happiness as she charged forward and pounced on her father. She was young, but she was definitely tough. Possibly the polar opposite of her mother. To be quite honest no one was quite sure where she got her personality from. She was rebellious, like Thirahan, and a little diva when she wanted to be. She had gills and fins on her legs so she could swim easily through the water, but also had ice spikes on her face and back. She rolled around her father and pounced on his back. She was already larger then most of her siblings, only being smaller then the oldest of them Thirahan. With a giggle she jumped back and spun in circles, then she sat down and said, "Hey daddy! Did you get me something? Huh? Did cha did cha did cha?" she asked excitedly as she pounced around him energetically. Ark walked further into the room while getting tackled by the hatchlings, they have been getting stronger recently which pleased Ark. With Ray jumping around with her usual energy he laughed and spoke "Hey hey hey, calm down. Yes of course I have something for you and the others" smiling and gesturing towards some tuna attached onto his tail. Proceeding to hand them out to all the hatchlings he continued, "So what you guys been up too when I've been gone" giving a cheeky smile. There was the sound of soft padding feet on the ground outside the small chamber that was the hatchery, specifically, Arkhor's den. There was a pause in the padding, then a quiet voice, edged with sadness and depression, but also some amount of hope. "Arkhor? C-can I come in? I came to see the hatchlings." Ark began to hear footsteps outside the den, wondering who it was he moved closer to the entrance, when he heard shine speak he replied, "Sure! Shine come in, as you can see I have my hands full" smiling at her as the hatchlings surrounded Arkhor while he was giving out the tuna. Shine stepped into the small cave, her green eyes downcast. "I-I don't know if I told you before, but...I'm sorry...about Trinya. I know better than most the feeling." She glanced away, sitting down. Her gaze found one of the hatchlings by accident, and she looked at it, a slight smile on her face. The smile fell when she next spoke. "But at least you know what happened to her." She murmured. She wasn't entirely sure if it was better to know what happened to your mate or worse, but Shine would have preferred it instead of wondering and wracking her brain for the things that could have happened to Korramyr. She shook herself and peered at the hatchlings. "They look healthy, though." She said, trying to quickly change the subject. "What're their names?" Rayla watched the new female enter the den and tilted her head at her, but she was more interested about the tuna, sinking her teeth into the fish. She then picked up one of the fish, looking quite awkward as she carried it over to the corner and sat there, growling whenever one of her siblings got close. When she heard the dragon mention someone named Trinyah, her ears perked. She had heard her father mention said name before. Rayla had never really known her mother. Plus she didn't know how babies were hatched, so her assumption was that she had just fallen from the sky on a heavenly cloud and her siblings had been thrown up by a shark. Well, she was a hatchling after all, she had a crazy imagination. "My name's Rayla!" she exclaimed when Shine asked who she was, rolling onto her back and staring up at the strange dragoness. A year has passed since Trinyah's death. Atlantis was still devastated for the loss because he considered her a close friend. The SeaWing Male Leader was walking towards Arkhor's den. Shine and him have decided to visit the hatclings that day. Atlas was a bit late because he has been busy finishing some tasks. Atlas curiously peered inside once he has reached the hatchery. "Arkhor, Can I come in? I'd like to see hatclings" He asked, waiting for permission. Atlas noticed that Shine was already here. Ark heart sank a little being reminded of Trinyah, he thanked shine "Yeah... thanks Shine, luckily I have these guys to help" he smiled, after Shine's second remark he didn't respond knowing that she was still in mourning for her own mate, which we all knew that he had disappeared. "Yeah I suppose knowing what happened made it quicker for me to accept it. Yeah their doing great" he responded than began pointing at each hatchling revealing their names to her. "Rayla & Thirahan the oldest are quite the rebels" smirking towards them both. He then heard another voice at the entrance it was Atlas, it looks like they had both planned to visit. Ark then spoke to Atlas "Yeah Atlas, feel free to come in." Atlantis trotted inside the den with a calm step to not scare the hatclings. He was indeed a big SeaWing, so the pups would look at him as a sort of giant. "Hi, Shine, Hi Arkhor. How are you?" Atlas cheerful greeted them. He quietly approached the nest, curiously looking at every hatcling. Atlas listened Arkhor and Shine speaking. "They're wonderful. They're growing very well." He smiled. Atlas lowered his neck to look at the pups a bit closer. He showed one of the most puppy and jovial faces, almost irresistible, in the attempt to entertain the cubs and help them to feel comfortable of Atlas presence. Shine smiled slightly and looked down at one of the larger hatchlings. She bent down to the hatchling's level, her green gaze soft and kind. "Well, hello, Rayla." She said, reaching out and tickling the hatchlings exposed belly. She didn't acknowledge Arkhor's responses, she didn't feel she needed to, and she didn't want to pour more salt water into the open wounds. She stood as another voice came, and she recognized it as her fellow leader's voice. "Oh, hi Atlas." She said, not turning. Her voice was rather quiet and unenthusiastic, but she looked at the hatchlings with a slight smile. As soon as her father arrived Aari jumped on top of him. However her excitement in seeing her father didn't last long. A couple other dragons entered and Aari was not the least bit pleased. She hated the presence of anyone that wasn't her family. She didn't even consider her grandmother family since she rarely came to visit. Aari tucked herself flat against her father as if that would make her invisible. Whatever her siblings were doing Aari payed no attention. Her focus was on the intruders and silently wishing them to leave. Only then would she feel comfortable again. While Aari crouched down, Rayla also did at the presence of Atlantis, since he was so much bigger then she was. But, trying to look tough in front of her siblings, she stuck her chest out and clawed at Atlantis's nose with her barely-sharp-enough-to-scathe-a-tuna claws, growling, before hissing at Shine and slithering over to the small pool, where she dove in and hid in the water, eyeing the intruders. Her shark tail and fins stuck up, along with the top of her head. She dove underwater and slithered into her little hideaway, disappearing from the strange people. She wondered if her sister would follow her. Ark blushed and nervously spoke feeling embarrassed from Rayla actions, "Please forgive Rayla, she still has much to learn" smiling at Atlas , Ark then replied to Atlas "Yeah I'm doing good Atlas, luckily I havn't been to busy. Yeah at this rate they will be as tall as me in a few years" he laughed while nuzzling Aari gesturing her to say hello. Then returning his gaze towards Atlas and shine, "This is Aari, shes just a bit shy"
Atlantis wasn't expecting that kind of reaction. He released a little growl of pain when Rayla hit his nose with her claws. Atlas pulled back his snout and looked at Arkhor. "Well, it looks they don't like my face." He laughed, noticing the other pups were trying to hide from him. It was normal that pups would not give trust to strangers afterall. Atlas turned towards his fellow leader. "Shine, do you believe i'm that ugly?" He asked at her with a joking growl, wondering for a moment if his puppy face has resulted to be indeed a scaring one. Oceana was out hunting food for the tribe. She had heard that some new hatchlings were born within the SeaWings tribe. She hunted some tuna and then left. Oceana wondered where Ashra was. After all, she was supposed to train her, but then could never find her ever since. She hoped that Ashra could come back. "If not, oh well..I guess. Maybe I could train one of the hatchlings once they get older, the elite tracker chuckled at herself. She was nearing the palace when a thought entered her head. "Hmm.. Since I'm bored for the rest of the day, why not go see the hatchlings?" But then a pain in her heart came. Arkhor's mate, Trinyah, had died. Oceana didn't really know Trinyah much, but the first time she met her, the white dragon was really fun to be around with. It seemed like the SeaWings were losing their mates a lot. "First Shine, then Arkhor.." Oceana hoped that once she had a mate, that he would not leave her, or die. She entered the palace and dropped off the tuna. Then she went to where Arkhor was. When she neared the door, the graceful dragon heard some talking, and they were not from the hatchlings. It seemed that it was from her two friends: Atlantis and Shiningwater. Then Oceana cheered up. She would get to see them again! Oceana knocked on the door quietly, hoping not to startle the little ones. "Arkhor? May I come in? I would like to see the hatchlings, if you don't mind." Her quiet sound, could be heard easily through the door. Shine gave the cowering hatchling a slightly curious look. Then stifled a laugh at another's reaction. She gave Atlas an innocent look in response to his question. "You? Scary? Yes. You're a big scary guardian. I, on the other hand, am I small, timid, frail healer." She said, blinking large green eyes at him owlishly. Then turned to Arkhor. "All hatchlings do, but there are plenty of teachers if you need help." Ark turned towards Atlas, "Hey don't worry, they are still young their still not used to visitors" he replied, again he heard a noise from outside the entrance, it was Oceana. "Sure Ocean hopefully we have enough room" he laughed while moving the other hatchlings further into the cave. Replying to Shine's question "Yeah soon these little guys will start training, teachers would be a good idea." Oceana heard that she could entered and went in carefully, hoping not to frightened the hatchlings. She gasp with happiness. The four hatchlings were all well, healthy, and all looked majesticly beautiful. There were two boys and two girls. One of them, Rayla, whose name Oceana overheard, seemed to be very active. "Hello Atlas, Shine," she greeted them happily. Then she turned to the father of the hatchlings, "Hello Arkhor, you have the amazing hatclings. They'll grow to be very active and smart." Oceana crouched down, to be about the same height as the hatchlings, "Hello guys. I'm Oceana. I'm glad to meet you guys!" By the look of the hatchlings, Oceana hoped to one day train them. Some of them looks agile enough and some are strong, just like a gaurdian. The tracker liked Rayla because she seemed to have a lot of childish manner. She liked those type of dragons the best. Oceana stood up slowly, and turned to Arkhor, "Are you doing well? I'm glad to see you that have amazing kids!" Rayla rolled around in her little underwater cave, bored. 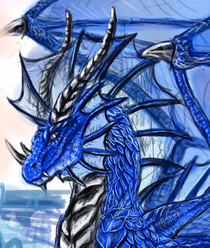 She poked her head out and stared cautiously at the bigger dragons from under the water. Something nipped at her tail, though, and she spun around to find the most adorable thing she'd ever seen in her entire life: A tiny red dragon. She let out a high pitched screech underwater, like that an excited fangirl would make, and lunged at it. Seeing danger, the little dragon sped around the small pool, trying to escape the bigger dragon's grasp. Rayla was allured by the height of this miniscule dragon. It was so tiny! She reached out her paws and attempted to scoop it up, but it made a hazardous left turn and, being unable to get her shark fins to move the right way in time, slammed into the wall. The little dragon swam to the surface quickly, jumping out and speeding across the floor. He was tiny. Smaller then even the tiniest dragons, Aiden, Calemvir, and Chibi. He was only about 4-6 inches tall. A very small dragon. He was more like a salamander then any dragon. he let out a hiss and stopped when he saw the gigantic dragons in the cave. This gave Rayla the time she needed and she sprang out, tackling the tiny dragon and capturing him under her paws. "Gotchya!" she exclaimed as she picked the tiny creature up. It hissed at her, and scratched at her paws, but Ray held it firmly. Its growls sounded more like mouse squeaks rather then anything a dragon could make. Atlantis turned towards ShiningWater, being instigated by her words. He answered at her owlish look with a sort of offended one. "I see you're very good at comforting your fellow leader." He joked with his usual playful tone. "Anyway the question was about me. I know you're aren't timid. I know you aren't frial. No need to tell me that." Atlas teased Shine with indirect compliments, a sort of encouragement in his voice. "About being small. You're right. I can't deny that." Atlas positioned himself next to Shine, like to do a size comparison. He was taller and larger than Shine. "I know you're a formidable fighter. Although you're a healer." He concluded with a laugh. Atlantis turned towards the SeaWings tracker. "Hi, Oceana. How things are going?" He asked while he noticed something weird happening in the water. It looked that Rayla has caught a very little and strange reptile creature. Oceana looked at the hatchlings again before answering Atlantis's question, "I'm doing well, thanks for asking. How about you Atlantis?" Then she realized that Shine was also there. Oceana was glad to see her happy a bit, "Hello Shine, are you well?" She noticed that Rayla had left the group and then returned with a creature. Oceana didn't know what it was. Hoping that it was not danger, she asked Rayla, "Umm.. Rayla, what is that? Make sure that it's not dangerous.."
Shine looked up and over at her fellow leader as he positioned himself next to her. It was true, he was a good few feet taller than her, not to mention his build was very different than hers. She smiled in slight response to his inadvertent compliments. "In comparison to you I am." She turned as Oceana walked in, and opened her mouth to say something when a quiet squeak from the small pool sounded. Shine's head turned by long-trained hours, and her healer instinct kicked in as Arkhor scooped Rayla up. "Is she alright?" She immediately questioned, her green eyes worried. She accidentally ignored Oceana, as other things were currently occupying her mind.